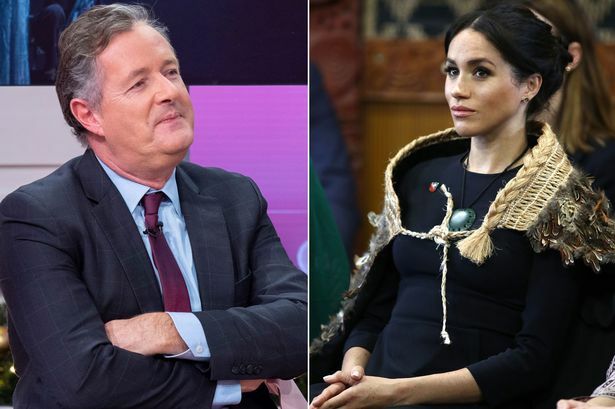 Piers Morgan has taken aim at his former friend Meghan Markle, accusing her of being a 'self-obsessed social climber' who 'discards' people once she's 'played' them. The Good Morning Britain host enjoyed a year-long friendship with the Suits actress, but claims he was 'ghosted' the minute she met Prince Harry. Now, he has accused her of 'using him for fame', and is trying to 'milk' her royal role for 'all it's worth'. "Anyone or anything that may not give her what she wants or gets in the way of her social climbing self-advancement gets discarded," he raged in a column for the Daily Mai l.
The pair struck up an unlikely friendship when Piers started following her on Twitter and Meghan almost immediately replied, "Well hello there - thanks for the follow. Big fan of yours!" Over the next few months they chatted regularly, discussing at length everything from US gun violence to her charity work, their shared hatred of early morning filming calls and even her family. She introduced him to her co-star and 'best friend' Rick, who played Louis Litt in Suits, and they too struck up a friendship with Rick appearing on GMB in Feburary 2016. In early June Meghan herself flew over to the UK and arranged to meet Piers at his local pub after watching her friend Serena Williams play at Wimbledon. They spent an hour and a half chatting before she headed off to meet friends for dinner at the trendy 5 Hertford Street in London's Mayfair. It was there that she met Prince Harry - and from that point on, Piers says his messages went to both her and Rick went unanswered. And he now believes that all the negative stories leaking out of the palace suggest her alleged ambitious nature has not been tamed. "Meghan Markle is a self-obsessed professional actress who has landed the role of her life and is determined to milk it for all she’s worth," he continued. Citing Princess Diana and Sarah, Duchess of York, who famously clashed with the Palace over their unconventional behaviour, he predicted that it's a supposed battle she's unlikely to win. "But she’s now finding out the hard way that if you try to ‘play’ the Royals and the Royal Household like she played people like me, you’ll come up against a system you can never beat. For the first time in her life, Meghan Markle has discovered she can’t always get what she wants," he added.